"What on earth we're we thinking?" Puffy sleeves and ruffled collars are definitely going to be one of those regretful moments. I can almost feel the future cringe... Oh, my! What was Mum/Granny/Auntie wearing here? Was that really in fashion?" We thought we were SO cool, and we were! 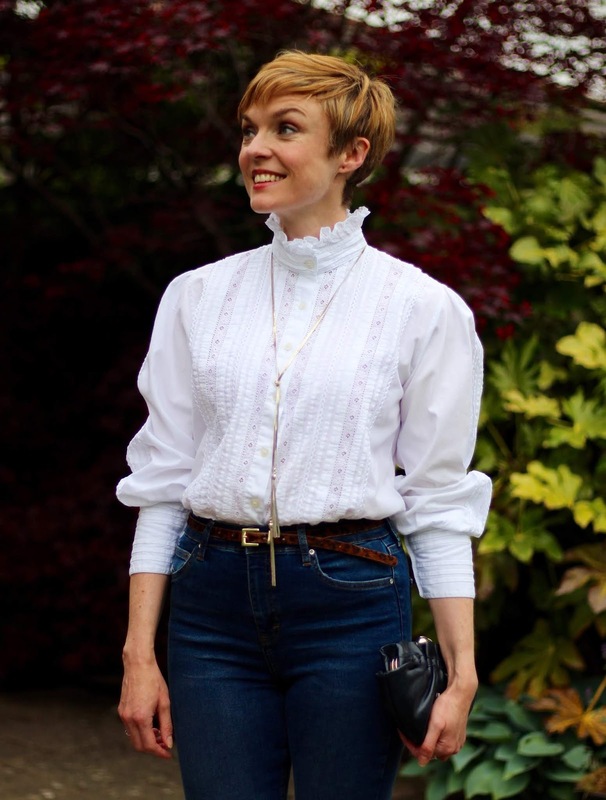 Today's look is all about a fabulous Victorian-inspired blouse that is the BEST quality ever. Stiff and crispy, with loads of great details. Of course, it's vintage and yes... it was on the £1 rail, like many of my best clothes! I have been looking around for a ruffle collar to try but the thought of spending £40+ on something I might not really like was just too much. Plus, with a design like this, if the quality is not there the whole look is ruined, and to find real quality nowadays you need to spend some decent cash. Something I try to avoid! Now, "Pulling off" a style like this (ye gawds, I hate that phrase!) is made so much easier by simply wearing your favourite jeans. Jeans make everything ok in my book. Oh, and my outfit was lifted into an even happier place by my new sandal/clog/shoes that I am a little bit in love with! Anyone who is looking for a more affordable (i.e. less of a rip off) version of Swedish Hasbeens should check out this brand... cute AND comfortable! If not, what trends do you think we're going to be laughing at in 20 years? BLOUSE: Vintage... try this toned down version.. or this OTT version! Last week Debbie stole my heart with her story and her love of all things pink and a bit girly. She really suits this feminine look... with ruffles too! I love ruffled blouses and always have. Although they are difficult sometimes to "pull off"... as you say. Ha. I like how you "toughen up" your blouse with jeans and chunky sandals. Looks fabulous. New romantics!!! Ahhhh yes, brilliant fun! What a lovely blouse. Love how you have styled it :) Thanks for hosting. I would totally have bought that blouse! Love the quality and detail -you don’t find that very often these days imho. You look great in that outfit, as always. 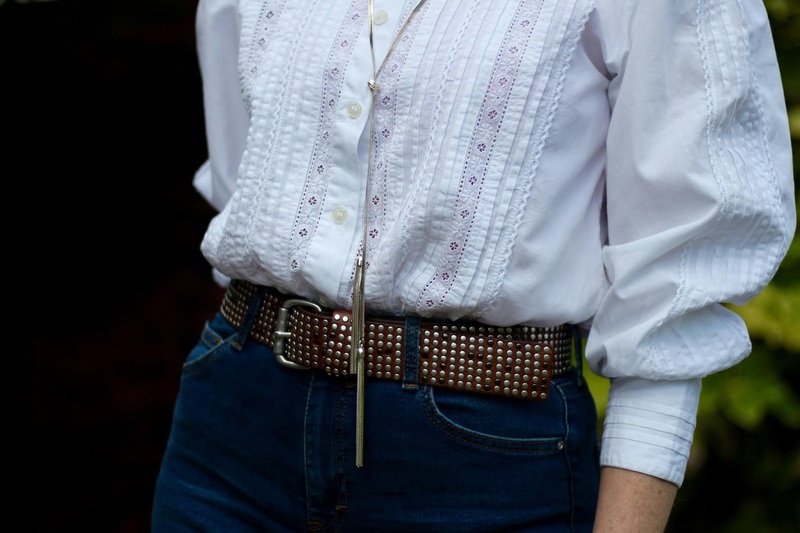 I have a robins egg blue shirt sleeved blouse very similar to this, with buttons up the back no less. It is one of my favorite blouses but I don’t wear it often but now you have inspired me to rock it with skinny jeans and heels, so thank you!! And if you want to get rid of that blouse at any time, let me know and I will pay the shipping!! Should have read short sleeved shirt! You're very welcome Sharon! Hehehehehe. I hope you get some more wear out of your shirt... that sounds very pretty BTW. I love this look on you. I'm not sure I could pull off that top, but I think it looks great the way you styled it. I think you look amazing in this top, but I definitely couldn't wear it as I carry all my extra weight on top. Plus, the collar would drive me crazy. I think there are lots of trends we will be laughing at 20 years from now: ripped jeans, cut out shirts, off the shoulder...will all top the list. haha! I love the mix of your fun leopard clogs with the frilly white blouse. It does look great on you Sam! I know I think of when I wore stirrup pants..( and they were never long enough) what was I thinkin? Oh I do love a pretty ruffled anything. And I agree that if you pair anything with denim, you are pretty much in the golden zone! Ruffles are tough though, I agree! I am way too big busted to wear a blouse like this but you are certainly looking fabulous in it! And those clogs are perfection! While I do like the top, once I saw the shoes/sandals/clogs it was all over! I'm officially in love...with a shoe...lol! I absolutely adore anything Victorian-inspired, so I love this blouse, Sam! I have a couple of tops similar to this but in black and without such puffy sleeves (which are pretty cool, btw). I'm unsure whether I'd look back and hate it though!! I'm sure plenty of my outfits will have me and my children scratching heads wondering what was going on. I loved blouses like this, blouses that Prince wore! Still do! Blimey Nancy you're right!... he was SO cool wasn't he??!! It's always those certain things that just seem to catch on, everyone wears them, they are in every store, and then they become overdone and look dated. The last few trends that really seem dated to me are cropped swing jackets (very 2008) and fitted blouses with little puffy sleeves (2006-7). Ruffles are everywhere, but a classic style never goes out of fashion. I love this blouse on you - nice score off the thrift rack! You're spot on there Sheila! Classics are classic and trends look very dated VERY quickly. I think it's in the subtle "updates" each time the trend comes around. 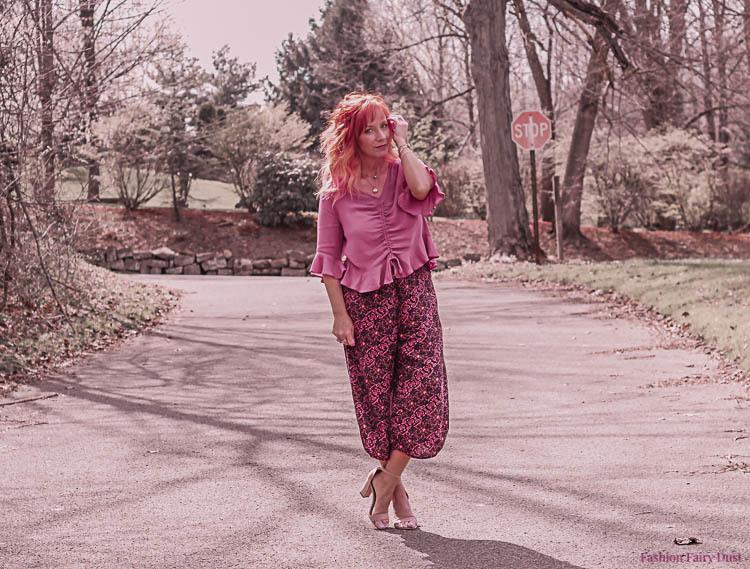 There's got to be something sophisticated and tailored about any outfit I wear that has a ruffle (unless it's pajamas!). You look so pretty here Sam!! You are absolutely spot on about jeans taking the edge off the ultra feminine ruffle vibe. This Victorian blouse looks well made and the details of tiny pleats and lacey insets are simply lovely!! Your styling is perfect!! Hahahahaha... You're SO right Jude! There has to be a crispness or structure if a ruffle is worn as outerwear, otherwise it's a bit of a non-event.